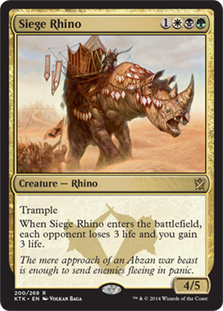 Whelp Siege Rhino has won another Pro Tour. It seems almost laughable in hindsight, but everyone's favorite three-color rhino didn't seem terribly well positioned coming into the event. The past couple weeks of Standard had solidified the front runners as Atarka Red, Selesyna Megamorph, and Dark Jeskai. Going in these were the decks to beat or join, which was mostly mirrored in Top 8 and the event as a whole. These three decks represented roughly half of the field and after slogging through it all we ended up with two Abzan Aggro decks, two Dark Jeskai, a Jeskai Tokens, a more aggressive Jeskai list, along with one of each of Selesnya Megamorph and Atarka Red in Top 8. It's important to keep in mind that the Pro Tours split between constructed and draft does obfuscate the format a bit. A bad draft run can kill an otherwise strong constructed deck. While the Top 8 decks tend to get a lot of attention, here are a few of the Standard brews just below the radar. If you don't follow the larger Magic community, this would have been an easy deck to miss, but it's generally accepted to be one of the breakout decks of the event. Any deck that's capable of a turn three kill requires at least some attention and it posted some of the best records among players, albeit falling a little short. In essence while the Atraka Red decks have trimmed the Become Immense + Temur Battle Rage package, Atarka Landfall doubles down on it. You play much the same game, but with slightly beefier and more resilient creatures. Having both Den Protector and Abbot of Keral Keep gives the deck a less all-in style compared to the Atarka Red decks that looks to go wider to the board. For those curious the turn three kill is turn one fetchland and one of your one drops, turn two fetchland and a Titan's Strength or Atarka's Command, and then turn three a third fetch land. This means you've got three fetchlands and another spell in the graveyard. You can cast Temur Battle Rage first, let it resolve, and then delve all five cards to cast Become Immense. 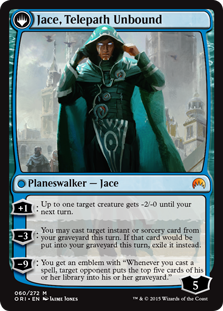 What crazy is there will be times when you're on the play and your opponent taps out on turn two for something like Jace, Vyrn's Prodigy and they just die. Despite some good initial results, Bring to Light has been on a bit of a downward spiral and the deck had a pretty abysmal showing at the Pro Tour. As the other decks have gotten increasingly tuned, it's not as simple to bash them over the head with raw card quality, especially when the Atarka decks are threatening to Become Immense + Temur Battle Rage when you tap out. That said, there's still something worthwhile in jamming 75 of the best cards together. Mana is so ridiculously good right now that playing four or five colors is not a huge stretch. A single Flooded Strand can get Blue, White, Green, and Black between Basic and Battle Lands. Cause why not play Siege Rhino and Jace, Vyrn's Prodigy in the same list? It's possible we'll see a departure from Bring to Light and just see four or five color control. Removing Bring to Light does limit some of the versatility and redundancy, but it opens up the deck to a bunch of powerful, more expensive, spells like Dig Through Time and Ugin, the Spirit Dragon. Esper Dragons is dead, long live Esper Control! While it had a few high profile finishes, the Esper Dragons deck has mostly fallen by the wayside with only a few players piloting it at the Pro Tour. A smaller number of dedicated players opted to ditch the dragon aspect and play just straight grindy Esper, with a much better percentage of them making Day 2 of the event. By dropping Dragonlord Ojutai the deck can focus more on irking advantage with cards like Jace, Vryn's Prodigy and Ojutai's Command. It just looks to play a more typical control game of counterspells, spot removal, sweepers, card advantage, and a smattering of win conditions. The win conditions are pretty much just awaken cards, some Ugin, the Spirit Dragons and your opponent giving up. The deck had some respectable finishes in the hands of some very talented players, so the verdict is still out on whether it's all that good or the likes of Reid Duke could win games with 60 Islands sleeved up. There was also a more planeswalker heavy version in the mix as well.